Hoping to build anticipation for the return of Arrested Development that has not already been accomplished by years of rumors and reports about it, Netflix has come up with a fairly clever method of marketing it—albeit, appropriately enough, in such a way that it will only be noticed by a select few. 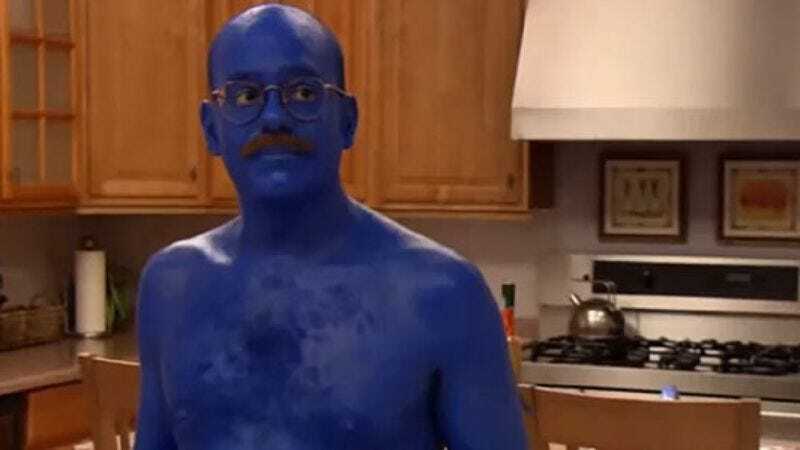 In addition to its putting all those fake movies and TV shows on there a while back, The Bluth Company Tumblr points out that any search for the word “blue” kicks up a results page littered with blue smudges and handprints. Click on one of those and you’ll be treated to the season two scene where Jason Bateman discovers similar marks all around the model home, leading him to find a just-blue-himself David Cross. As Slashfilm suggests, it’s possible this is but the first in several yet-to-come Arrested Development Easter eggs on the site leading up to its fourth-season debut. So far we haven’t discovered anything via our searches for “banana,” “loose seal,” and “just put the goddamn thing on here already, come on,” except that The Jeff Healey Band: Live At Montreux comes up under “banana” for some reason. Was Jeff Healey a big banana fan? Was “Angel Eyes” written for a banana? Perhaps investigating this is meant to help us kill the time until Arrested Development premieres. Very clever, Netflix.